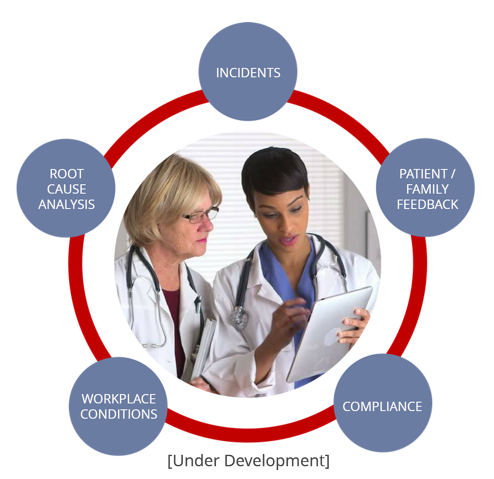 Hospital Incident Reporting Systems Capture Only An Estimated 14 Percent Of The Patient Harm Events. Safety Reporting & Improvement on the Readiness Rounds platform is a significant step up in providing easy access throughout your organization for the processing, analysis, and actioning of events as they occur. Safety Reporting & Improvement comes with fully-customizable templates and "degree of harm" assessments. In addition, the platform has the ability to add unlimited additional event-type templates. ✔ Integrates and organizes events/incidents into a single patient safety dashboard. ✔ Easy-to-use format encourages staff reporting and ensures event details are recorded in a timely fashion. ✔Integrates Agency for Healthcare Research and Quality (AHRQ) Common Formats. ✔Aggregates National Quality Forum (NQF) “Serious Reportable Events” and Centers for Medicare and Medicaid Services (CMS) "Hospital-Acquired Condition" data. ✔Comprehensive reporting package for various review committees. Patient Satisfaction Guide. Are you using all 9 approaches?